I was given some samples Evanger’s dog treats to try out and was instantly drawn to fact that they are 100% whole meat treats that have been gently dried and can be fed to both dogs and cats. I have two small dogs that I love to spoil. While some human food is OK, there is a lot that could be potentially toxic, so I’m always on the lookout for a new doggie treat that gets them excited and is also good for them. These treats are all also grain-free. Perfect for the growing number of dogs with grain allergies (mine included). If your dog is scratching and licking a lot, could be an allergy to their dog food. My Shih Tzu is older and has bad teeth. He needs treats that are easier to chew. The beef liver is perfect for him. The beef tongue was great for my younger dog that likes to chew on chewier things. The smell of the Wild Salmon drove them crazy the moment I took the top off the tub. 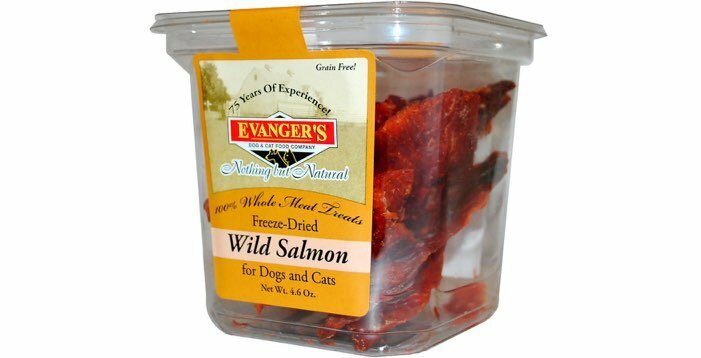 If you’re looking for a healthy whole meat treat for your pups (that you can also share with your kitties) you’ve got to give Evanger’s a try. These would also make an excellent stocking stuffer for the holidays. I checked out their dog foods and liked that they have low grain and grain free holistic formulas. They don’t use corn, wheat or soy in their dog foods but they do contain omega 3 & omega 6 fatty acids which are important to the health of all dogs. If you’re looking to change your dogs food, you should take a look at Evanger’s.